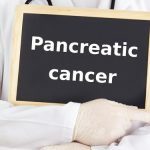 • What Causes Pancreatic Cancer? Pancreatic Cancer begins when the tissues of the pancreas – an abdominal organ that resides behind the lower portion of the stomach – begin to grow abnormally. The formation of cancerous (malignant) pancreas cells are different than normal healthy cells which typically grow, reproduce (divide) and die off. Alternatively, the malignant cancer cells of the pancreatic disease continuously reproduce without dying, eventually causing a massive amount of tissue that develops into a life-threatening tumor. Statistics maintained and released by the American Cancer Society reveal that an estimated 53,000 individuals (nearly equal numbers of men and women) will be diagnosed with the life-threatening disease in 2017. An additional 43,000 men and women will succumb to the disease this year. Out of the total number of the cancer cases in the United States, pancreatic cancer accounts for approximately three percent of diagnoses and seven percent of cancer deaths. The overall risk of acquiring pancreatic cancer through a lifetime for both women and men is approximately 1.5 percent or one individual out of every 65. However, there are specific risk factors that can affect the potential development of the disease. The above risk factors can increase the risk of developing the disease because they affect pancreas cell DNA, causing the formation of abnormal cell growth and tumors. The DNA has genes that control how the normal (oncogenes) cells will grow, reproduce and eventually die. In addition, the normal cell can repair any change or mutation in the DNA or kill off the cell at an appropriate time using tumor suppressor genes. Inherited Gene Mutations – Individuals can inherit gene changes or mutations from their parents and ancestors to increase their potential risk of developing the disease. The inherited gene is considered part of syndromes that cause a tiny portion of all cancers of the pancreas. Acquired Gene Mutations – Any changes to the DNA that occurs after the individual is born is considered an acquired gene mutation that can result from a variety of factors including exposure to tobacco smoke and other cancer-causing chemicals. These sporadic (non-inherited) DNA mutations often involve mutations of the TP53 and P16 genes but can also affect changes in other genes including DPC4, BRAF, and KRAS, which are not considered a classification of inherited syndromes. Surgery – Curative surgery (if possible) can be performed to resect (remove) all cancerous tissue and tumors. Additionally, the surgeon might perform palliative surgery if the imaging results showed that the cancer has metastasized to other areas of the body. Palliative surgery can relieve common symptoms and prevent serious complications including blocked intestines and bile ducts. Palliative surgery does not attempt to cure the disease. Staging Laparoscopic – The surgeon can assist the doctors in determining the extent of the disease and if a resection (removal) of tumors and tissue can be performed. The surgeon will make small cuts (incisions) into the belly (abdomen) before inserting thin, long instruments with video cameras to see how far the disease has metastasized (spread) to other areas. Chemotherapy – Using anti-cancer medication that is injected into the patient’s veins or taken orally has the potential of killing off cancerous cells after they have metastasized to other areas of the body. Many forms of chemotherapy are given prior to surgery or after surgery are effective when other treatment options are unavailable. This procedure is also referred to as chemoradiotherapy and chemoradiation. Radiation – Directed beams of x-rays and other high energy machines can kill malignant pancreatic cells. This type of treatment is used alone or as an adjuvant treatment use concomitantly with surgery, chemotherapy or others. Possible side effects include changes to the skin (peeling, blistering redness), fatigue, diarrhea, vomiting, nausea, unexpected weight loss, and loss of appetite. Embolization or Ablation Treatments – If the cancer tumor can be destroyed without surgery, the doctor may choose ablative treatments including radiofrequency ablation, microwave thermal therapy, and cryosurgery, or embolization to block the flow of blood to the cancer cells using arterial embolization, chemoembolization or radioembolization. These treatments have serious side effects including the development of blood clots, infection, nausea, fever, abdominal pain, or internal bleeding. Palliative Care – The management of pain associated with the pancreatic cancer is a crucial component for treating patients who suffer from the disease. One of the major side effects of pancreatic cancer is extensive and severe pain that is usually caused when the nerve presses or invades areas near the pancreas, back or abdomen. The doctor will choose a variety of pain management options including the use of opiates and morphine that can be taken orally in pill form, or as a patch placed on the skin of the body once every three days. There are significant side effects to taking these medications including addiction to the drugs. Other known side effects include constipation, sleepiness, and nausea.